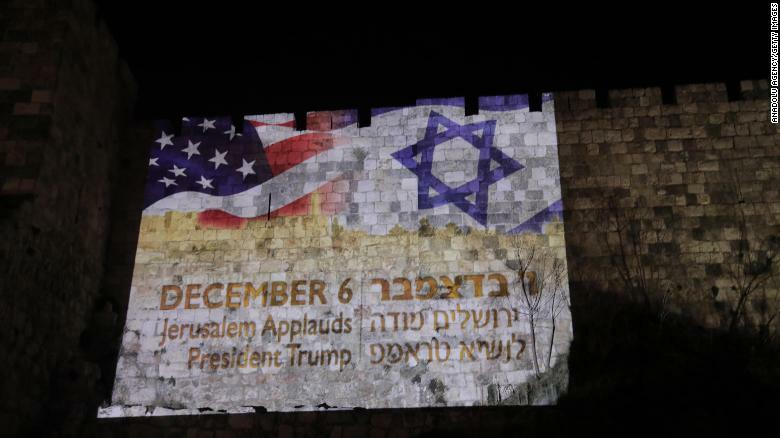 Flags of the United States and Israel are reflected on walls around the Old City of Jerusalem in acknowledgement of President Trump's announcement. (by John Podhoretz, NY Post) – ‘This is nothing more or less than a recognition of reality,” President Trump said in announcing America’s recognition of Jerusalem as the capital of Israel. Never have truer words been spoken, and they were delivered in the best speech Trump has ever given. What Trump did was stunning. He could just have signed the waiver of the law passed in 1995 compelling the executive branch to move America’s embassy from Tel Aviv to Jerusalem. He did it six months ago, just like his three immediate predecessors did every six months since 1996. Or he could have not signed the waiver and simply said he was going to start the process of building the new embassy. Instead, he called the international community’s seven-decade bluff and ended a delusion about the future that has prevented Palestinians from seeing the world and their own geopolitical situation clearly. It is a bold shift. The idea that Jerusalem is not Israel’s capital has been a global pretense for decades, including here in the United States. It’s a pretense because Jerusalem has been Israel’s capital from the moment the new country secured a future by winning a bloody war for independence waged against it by Arab nations after they rejected the UN partition of the old British mandate into a Jewish state and an Arab state. Under the plan, Jerusalem was to be an international city governed by the United Nations. But the Arab effort to push the Jews into the sea — an effort no other nation on earth intervened in to prevent — left a divided Jerusalem in the hands of the Jews in the West and Jordan in the East. There would be no “international” Jerusalem because the Arabs made sure there could not be one. So, in 1949, Israeli Prime Minister David Ben-Gurion moved the government from Tel Aviv to Jerusalem. “The people which faithfully honored for 2,500 years the oath sworn by the Rivers of Babylon not to forget Jerusalem — this people will never reconcile itself with separation from Jerusalem,” Ben-Gurion told the United Nations at the time. After Israel’s triumph in the Six-Day War in 1967, Jerusalem was unified and became, in the words spoken by every Israeli prime minister, the “eternal and undivided capital” of the Jewish state. And yet the international fiction that Jerusalem is not only not Israel’s capital but isn’t even to be considered formally part of Israel has persisted for 50 years now. Nominally, the idea is that Palestinians need to be allowed to believe they’ll secure sovereignty over at least a part of Jerusalem for them to pursue a final peace deal with the Israelis. And so most of the world has chosen to act as though Israel has no legal dominion over any part of Jerusalem. That is, in a word, insane. Jerusalem is now home to 860,000 people — 10 percent of Israel’s population, nearly double that of its second city, Tel Aviv. Every one of them, Jew and Arab, is a citizen of the state. (The city is 60 percent Jewish and 35 percent Muslim.) It is the locus of Israel’s government, where the parliament sits, where the prime minister lives and where most government agencies are located. The pretense has been allowed to continue for two reasons. The most rational reason is this: There has always been fear that any change in Jerusalem’s status might ignite a violent Palestinian response, retard peace efforts and inflame the “Arab street” throughout the Middle East. So why create a crisis when the status quo is at least stable? Then there are those who simply believe Israel is a bad actor deserving of international scorn and isolation and should not be allowed to get away with it — it, in this case, being Jerusalem. The Palestinian refusal to accept Israel for what it is and what it has become has been the greatest bar to peace. And there are reasons to believe the so-called Arab street has bigger problems to concern itself with right now than Israel’s capital. And not just the street — the capitals as well. Trump’s act comes at a time when there is a tectonic shift in the Middle East. If I had told you 20 years ago that Israel would one day find itself in a de facto alliance with Saudi Arabia and Egypt, you would’ve had me committed. But two weeks ago, Saudi Crown Prince Mohammed bin Salman (MBS) reportedly urged Palestinian Authority President Mahmoud Abbas to sign on to a peace deal Israel actually likes. MBS isn’t happy about Trump’s move, but that doesn’t change the fact that the sands are shifting rapidly after decades of stagnation. In the end, as Trump said, “Israel is a sovereign nation with the right, like every other sovereign nation, to determine its own capital.” Indeed it is. Indeed it does. Bravo. Published December 6, 2017 at The New York Post. Reprinted here on December 7 for educational purposes only.